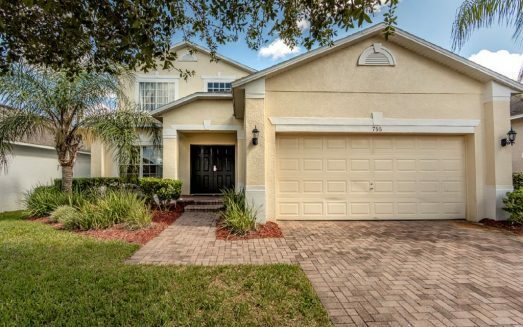 Book now your Orlando Vacation Rental with our Beautiful Solterra Villa in Florida! With six bedrooms, three and a half bathrooms, 15’ x 15’ living area, and a vibrant 16’ x 17’ game room, there’s plenty of space for you and your crew to relax and have fun. The house has a clean, bright design and is located on a cul-de-sac in the Solterra Resort, with a southwest facing garden, which means extra privacy for you. If you have a cook in the family, there’s a great BBQ grill and a full kitchen loaded with cooking utensils, granite countertops, and other goodies. Enjoy a meal in the nook or dining room, or head outside to the lanai. Solterra Resort is a gated community, and its Clubhouse goes above and beyond with its huge pool and slide, tennis courts, volleyball court, football pitch, gym, lounge area with TVs, tea and coffee, and an outdoor log fire. All of this is free for guests staying in our vacation home! Why not get out and mingle with other resort guests? Want to make this your vacation home? Contact us at 1-888-653-0293 and we’ll get you and your family all set up here at Solterra Sunset!